I never knew Roxy had watches! When it comes to beachwear, Roxy is the first brand that comes to mind. True enough, it’s the same for Roxy watches. They are as sporty chic as the rest of Roxy’s line. Aren’t these cute? They look so vintage! They remind me of the old watches we used to wear when we were little, except these are far more fashionable! Got poor eyesight? These watches are for you. Haha! Kidding. These watches are so charming–casual and sporty but still unique in their own way. You know how much we love our plastics! Leather watches are so high maintenance. Now that summer is just around the corner, I’m sure we’re all lining up a few summer activities with our friends to make the most out of the season. I think these watches are perfect for that! The added bling takes these watches from just sporty to sporty chic, don’t you think? Presenting, the Roxy Jam watch. It’s probably my favorite from all the Roxy watches. It’s young and fun vibe won me over. I love that it comes in a variety of colors too! For girls like me who prefer big watches, the Roxy Jam in regular size is for you. 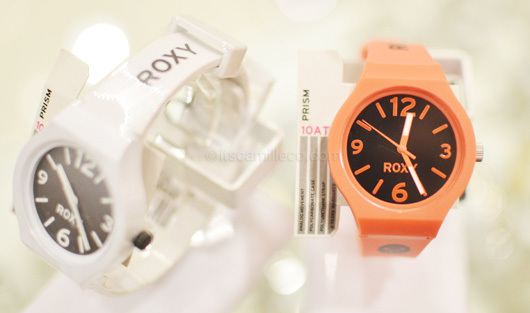 If you want a smaller version, take a look at these Roxy Jam watches in mini size. 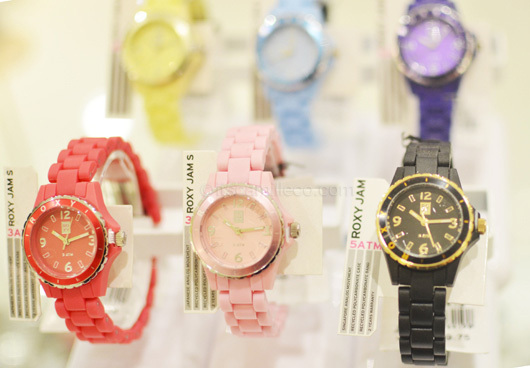 Roxy watches are available in all SM Department Stores. Tweet this: “I want to win a Roxy watch from http://itscamilleco.com! #ItsCamilleCoGiveaways” Please do not tag my Twitter name. Contest is open to Philippine residents only. Deadline for entries is on Feb. 1 at 11:59 P.M. The 4 winners will be chosen based on their answers and will be announced via my Twitter. Good luck everyone!